Finding a ninth planet in our Solar System this late in the game would be fascinating. It would also be somewhat of a surprise, considering our observational capabilities. But new evidence, in the form of small perturbations in the orbit of the Cassini probe, points to the existence of an as-yet undetected planet in our solar system. Back in January, Konstantin Batygin and Mike Brown, two planetary scientists from the California Institute of Technology, presented evidence supporting the existence of a ninth planet. Their paper showed that some Kuiper Belt Objects (KBOs) display unexpected behaviour. It appears that 6 KBOs are affected by their relationship to a large object, but the KBOs in question are too distant from the known gas giants for them to be responsible. They think that a large, distant planet, in the distant reaches of our Solar System, could be responsible for the unexpected orbital clustering of these KBOs. Now, the Ninth Planet idea is gaining steam, and another team of researchers have presented evidence that small perturbations in the orbit of the Cassini spacecraft are caused by the new planet. Agnès Fienga at the Côte d’Azur Observatory in France, and her colleagues, have been working on a detailed model of the Solar System for over a decade. They plugged the hypothetical orbit and size of Planet Nine into their model, to see if it fit. Planet Nine is calculated to be about 4 times as large as Earth, and 10 times as massive. It’s orbit takes between 10,000 and 20,000 years. A planet that large can only be hiding in so many places, and those places are a long way from Earth. Fienga found a potential home for Planet Nine, some 600 astronomical units (AU) from here. That much mass at that location could account for the perturbations in Cassini’s orbit. There’s more good news when it comes to Planet Nine. By happy accident, it’s predicted location in the sky is towards the constellation Cetus, in the southern hemisphere. This means that it is in the view of the Dark Energy Survey, a southern hemisphere project that is studying the acceleration of the universe. The Dark Energy Survey is not designed to search for planetary objects, but it has successfully found at least one icy object. There are other ways that the existence of Planet Nine could be confirmed. If it’s as large as thought, then it will radiate enough internal heat to be detected by instruments designed to study the Cosmic Microwave Background (CMB). There is also an enormous amount of data from multiple experiments and observations done over the years that might contain an inadvertent clue. But looking through it is an enormous task. As for Brown and Batygin, who initially proposed the existence of Planet Nine based on the behaviour of KBOs, they are already proposing a more specific hunt for the elusive planet. They have asked for a substantial amount of observing time at the Subaru Telescope on Mauna Kea in Hawaii, in order to examine closely the location that Fienga’s solar system model predicts Planet Nine to be at. For a more detailed look at Batygin’s and Brown’s work analyzing KBOs, read Matt Williams’ article here. 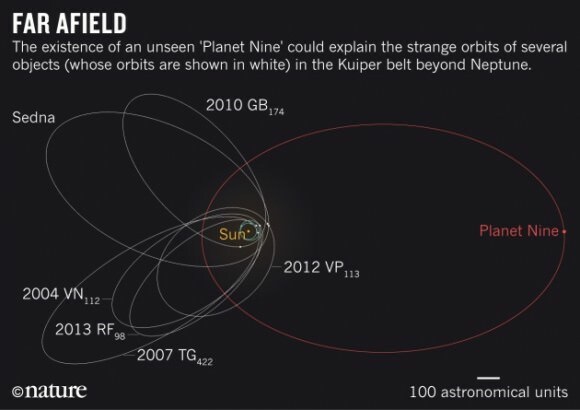 Please stop referring to this hypothetical planet as a “ninth planet” or “Planet Nine,” a name deliberately chosen by Brown to reinforce his self-imposed, highly unscientific claim to having “killed” planet Pluto. If this object exists, it would not be the solar system’s ninth planet but more like its 15th, as dwarf planets are planets too. They are a subclass of planets, as intended by the scientist who first coined the term, Alan Stern. According to the geophysical planet definition, our solar system already has a minimum of 13 planets, 14 if one counts Charon as part of a binary system with Pluto. This means any undiscovered planet would be more like Planet 15. As a means of staying neutral in the planet debate, I request you refer to this hypothetical planet by the term “Planet X,” with “X” referring not to 10 but to the unknown, as it does in math. This is the term traditionally used in discussions of theorized but as yet undiscovered planets. You might want to look up the definition of a dwarf planet. An object 10 times the mass and 4 times the size of Earth would not classify as “dwarf” . . . The validity of the claim you make about Brown’s motives for that chosen nomenclature depends directly on your apparent supposition that he cares about picayune minisculities caused by the hypnotic effects that Semantics has on petty minds as much as you apparently do. I’m confident to say that that he does not. I agree with Laurele and in my opinion, this hypothesis is based on an argument from ignorance fallacy. We have 6 KBO’s whose trajectories shows that their orbits were disturbed by a massive object(s) at some point in the distant past. Could it be a planet? Strange that the WISE space telescope, designed to find remote Solar Systems objects, didn’t detect it. A star passing by in our vicinity? Our Milky Way doesn’t have a shortage of those. A molecular cloud? A swarm of icy bodies? There are so many possibilities that until observations points to the contrary, a “we don’t know” is the way to go, not filling the gap with a self serving answer to promote an still unproven fantasy. Religious types have been doing that for thousand s of years…. No fantasy, no hypotetical planet. Some black scientif. authorities, their servants are persuading public for till 30 years that there is nothing beyond Pluto. They (15 years ago and more) even dishonested scientiests (me too) who climed that it is impossible that such bodies, comparable with Pluto even exists. When I started my search of historical evidences (from Egyptiam, Sumerian, Biblical, Mayan,…and even older sources) I was accused (paper was send by my coleague to rector of university,..) from ocultismus, magia. We speak now about Mysterious Pull On Cassini Probe May Help Find Planet Nine, but where are pulls on Pioneers, Voyagers?! They were packed off the table. It was done so that there are not deviations, but not correct mass of Neptune was used,…?! No fantasy, no hypotetical planet. Some black scientif. authorities, their servants are persuading public for till 30 years that there is nothing beyond Pluto. They (15 years ago and more) even dishonested scientiests (me too) who climed that it is possible that such bodies, comparable with Pluto even exists. When I started my search of historical evidences (from Egyptiam, Sumerian, Biblical, Mayan,…and even older sources) I was accused (paper was send by my coleague to rector of university,..) from ocultismus, magia. We speak now about Mysterious Pull On Cassini Probe May Help Find Planet Nine, but where are pulls on Pioneers, Voyagers?! They were packed off the table. It was done so that there are not deviations, but not correct mass of Neptune was used,…?! Is this some sort of Burroughs/Gysin-esque cut-up of a text that actually makes sense… both grammatically and logically? I remain unconvinced. The authors of this paper have added one more variable parameter to the fitting model, and found that for most values of it the fits get worse, with marginal improvement for a small range of values. That’s usually the behaviour you get for *any* new model parameter, whether it’s physically motivated or not. I’m shocked that you would think so. Shocked. Even if you can’t visually observe, no biggie. Just say it’s made completely out of Dark Matter and just being able to detect it by it’s gravity effects as proof. I mean we do that with everything else . . .
TROLL, TROLL, TROLL, TROLL, TROLL, TROLL, TROLL, TROLL, … You people really get off on peeing all over on other people’s excitement, don’t you. Makes you feel that good… that important that you need to go places where you know people that don’t think like you congregate and cry and moan and feel important… in the know in a room of idiots. That behavior isn’t much different from going to Gay funerals and picketing. Get a life, a-holes! Why peruse, let alone comment on science based sites when you understand as little about the topics as you apparently display with this comment? …and no one else seems to care enough to comment on the fact that the article is grossly innacurate. Did the author even think to reach out to CassiniSaturn science team to confirm this info before publishing to maybe an audience of hundreds of thousands? An audience now misinformed. How credible a source is Universe Today….really? Get your facts straight!